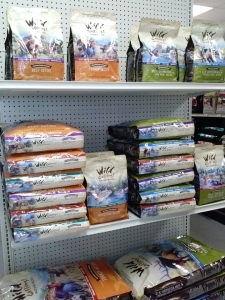 We’re happy to announce that Wild Calling dog food is now in stock! Wild Calling dog food is a grain-free dry food with three single-protein (25% protein), three multi-protein formulas (32% protein). It’s made with a variety of carbs that provide balanced energy release. We’re having an in-store drawing for a free 4.5-lb. bag! Come in between today and next Thursday to enter. One entry per customer.